The minimal .Net Framework version for this solution to work is 4.5. The webpartmapping.xml and webpartmapping_latestfrompackage.xml represent the transformation model that describes how the transformation will happen. You typically will tweak the webpartmapping.xml file to your needs by for example adding additional mappings to your own web parts. If you later on install an updated version of the nuget package your webpartmapping.xml will not be overwritten by default but the webpartmapping_latestfrompackage.xml will be. You can use this latter file to compare the latest out-the-box mapping with your mapping and take over the changes you need. Consult the web part transformation list article to learn more on the possible mapping properties. 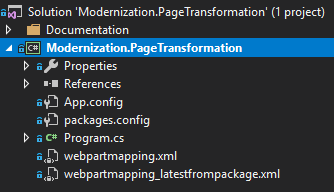 The default transformation behavior is doing an in-place transformation, meaning the modern client side page is created in the same location as the classic page was. You can however also create the modern version of the page in another site collection by providing a client context object for the target site collection. Not all web parts lend themselves well for a cross site transfer, check the Cross site support column in web part transformation list to learn more. Publishing page transformation always will be a cross site transformation as mixing modern client side pages with publishing pages is unsupported. Below sample shows how all publishing pages starting with an "a" are transformed to client side pages in the https://contoso.sharepoint.com/sites/mycommunicationsite site. This sample also shows how to provide a custom page layout mapping file.